The CBRE analysis showed the U.S. industrial availability rate (estimated unfilled or soon-to-be vacant warehouse space) is now at just over 7 percent – the lowest its been in two decades – and on its eighth straight year of shrinkage. Right now, it’s especially tight because third-party logistics companies are rushing to move third-quarter inventory so warehousing space is cleared for a bustling holiday season expected to be bustling. Cleveland warehouse space companies like On Time Delivery & Warehouse recognize that impending new tariffs has importers signing off early on last-quarter goods. Last month, more than 1.8 million 20-foot equivalent units (standard container cargo measurement) were handled at the busiest stateside seaports – an uptick of nearly 3.5 percent since last year. But even as 50 percent of Chinese retailer imports have been slapped with 10 percent levies, trade experts anticipate we’re still going to see higher-than-usual inbound goods. Plain English: The high demand for warehousing space and distribution services means you can expect competition to be fierce for the foreseeable future. What you can’t do is compromise the quality and service level of your warehousing provider, but neither should you wait just a few weeks before you need space to start looking. To do so is to risk costly supply chain disruption. It’s not unheard of for companies to sign for space before they actually need it. 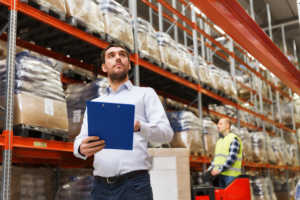 Third-party logistics warehousing is a good option for companies whose inventory is prone to fluctuation. It’s common for companies to have little idea what their warehouse needs will be in one year or three. Working with a dedicated supply chain management company allows you the freedom to roll with those waves. Cleveland in particular is an excellent market for warehousing from a geographic standpoint because products sent from this hub can reach 70 percent of the population in the U.S. within 24 hours or less. It’s not just about securing space, but partnering with a 3PL warehousing and distribution company that can offer quality facilities and the benefit of knowledgeable, experienced staff. For many companies, that search ends with On Time Delivery & Warehouse. Our 90,000 square feet of temperature-controlled indoor Cleveland warehouse space and 5 acres of storage outdoors is overseen by skilled, experienced staffers and offers remote inventory management services. Additionally, our team can help help you with shipping and distribution, with special services including product coding and repacking, transloading, cross docking and more. If you have questions about Cleveland warehouse space and distribution 3PL partnerships, contact On Time Delivery & Warehouse by calling (440) 826-4630 or sending us an email.